Recently I wrote an article about Google+ and, more specifically, how the right Google+ strategy can help you get more content into page one of the SERPs more often. In that post I mentioned that in addition to building your Google+ network and getting people to circle you, it’s also a good idea to work on engaging your niche influencers in hopes of them, someday, engaging you back or sharing your content with their audience. Talk about putting the cart before the horse, Adams! How can you engage influencers if you don’t know who your influencers are? I love this question. I loved it then, and I love it now. Here’s a spruced-up recap of what I told Ken from North Carolina. Are there any big conferences that happen in your niche? If so, who speaks at these conferences? If these people were selected to speak to hundreds or thousands of attendees, someone important thinks they are influential. 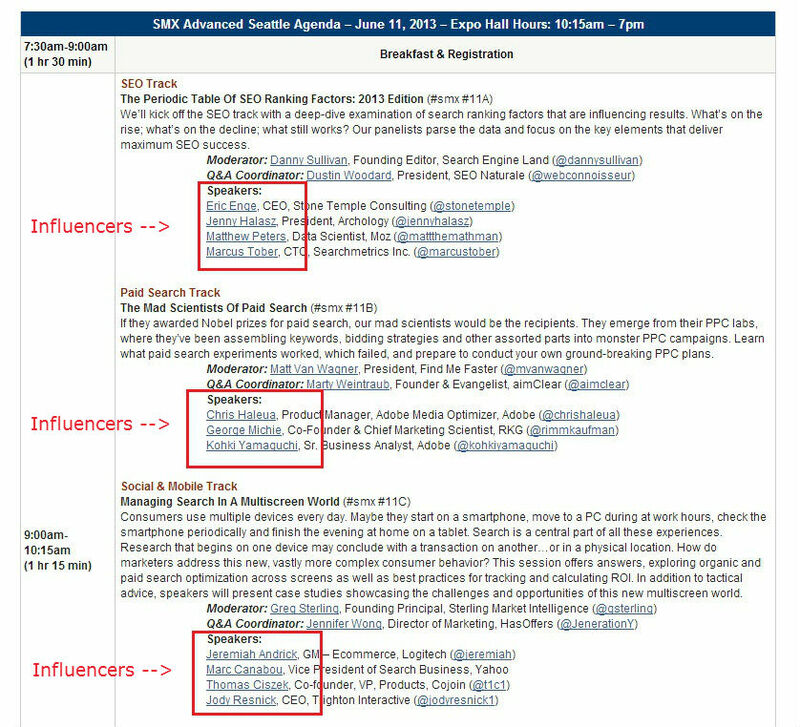 As an example, SMX is a big conference in my industry, so all the people who speak at SMX are great influencer candidates for me. Who are the authors in your niche? Who’s publishing books about the topics your audience is interested in? Search around Amazon; find authors that write about topics that your audience is interested in then start investigating the authors who have lots of 4- or 5-star ratings on their books. You’ll want authors with good ratings because good ratings mean people are actually reading (and enjoying) the books he/she is writing, which means there’s a chance he/she could actually have a following and be a niche influencer. After you find some candidates on Amazon, research these authors in social media. Are they on Twitter? Are they on Google+? Do they have a lot of followers? Do they write about content that is interesting and relevant to your audience? If yes, you have found a new (potential) influencer! Add them to a G+ circle. Then, as appropriate, start sharing their content with your audience taking care to mention them as the author in the post using the +their name feature (just type a + before their name to send them a Mention notification, like +Seth Godin or +Chelsea Adams). If you’ve already stalked, er.. researched, them on Twitter, add them there, too. In his question Ken said he has competitor’s circled on G+, but, rightly so, he doesn’t want to consider his competitors his influencers. While I agree that it may not be best for your competitors to be your target influencers, I also urge you to not overlook the forest for the trees. While you don’t want your competitors to be your influencers, you may want your competitors’ influencers to be your influencers. Look at who your competitors are sharing and who they are talking to in the comments. They might be making arbitrary choices, but they also might not be! Do the people your competitor’s share have a strong following? Are they writing content that is of interest to your audience? If yes, take note and add them! You and your competitors do the same specific thing so it makes sense you would target some of the same influencers. 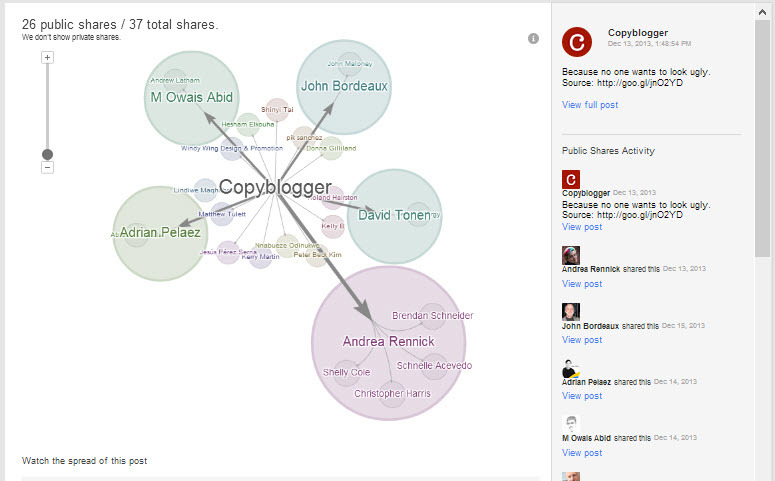 Google+ Ripples are an awesome way to identify influencers. Here’s how it works: Identify a relevant post in your G+ timeline that has a lot of shares, or, better yet, go to the G+ page of one of your influencers (you only need to have one identified and circled to do this). Scroll their Google+ wall and identify a post with a lot of shares, then click the little downward facing arrow in the upper right corner of the post (it’s right above the hashtags; you’ll see it appear when you hover over the post near the right corner). Choose View Ripples from the pulldown menu. Now you can see stats about who shared the post, and which of those shares resulted in more shares. Hint: People who share your content and then get reshares on their shared content are likely influencers! So, if you share a post, and then Andrea shares it, and then from Andrea’s share four other people share it, there’s a good chance you’ve uncovered an influencer discovering Andrea. This is an amazing tool! On a post’s Ripples page you will also see a box at the bottom that says Influencers: People with many public reshares. This list basically synthesizes who your influencers are for the selected post and lets you know in a list form how many shares resulted from their engagement with your post. For extended learning, here’s the G+ help page that explains how to access Ripples and here’s a Moz video about Ripples (skip to 7:23 to hear the part about Ripples). As you start to uncover more and more influencers, start spending more time looking at their pages. You really only need a couple influencers to start this process. Look at their G+ timelines and see who is commenting on their content. These people may not always be influencers, but sometime they will be. Influential people tend to be friends with other influential people. Go to FollowerWonk.com. 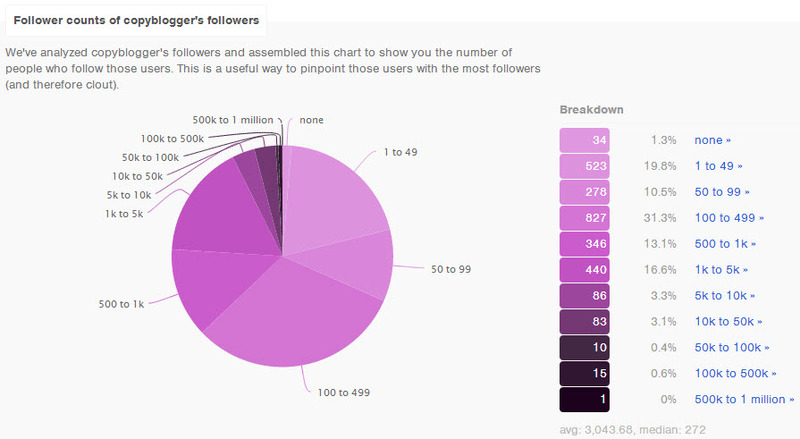 Go to Analyze followers. Type in your Twitter handle – or the Twitter handle of one of your niche influencers – and select Analyze Their Followers from the pulldown menu. When the page loads you’ll see all kinds of data about the people who follow the Twitter handle you entered. 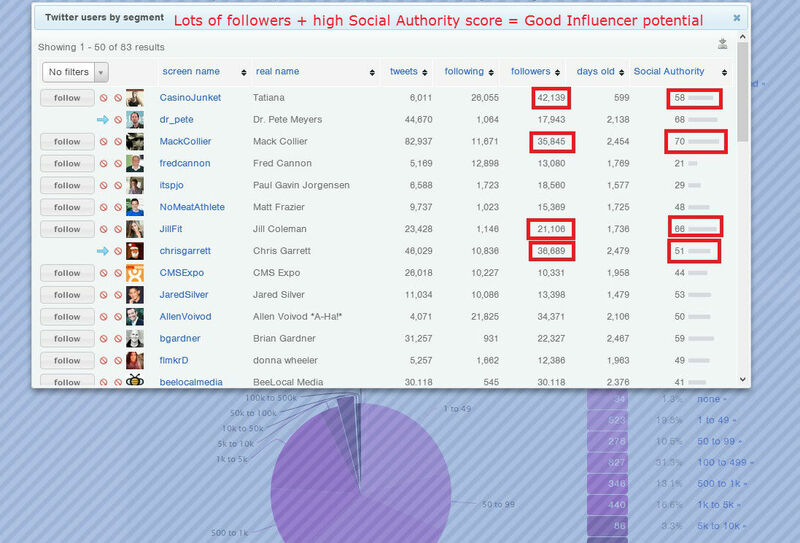 To identify potential influencers look at the Follower counts of [@handle’s] followers section. This section will tell you how many followers your followers have – or, for our purposes, how much potential reach they have and whether or not they are a potential influencer. Click on (for example) the 100k-500k section of the pie chart to see a detailed list of all of your followers that have 100,000-500,000 people following them. In the detailed list view make sure to take note of their Social Authority score. Higher is better. 45 is great. 15 is ok. 1 is not worth your time. When you find some prospects with a good Social Authority score and a high number of followers, look at their Twitter profiles to make sure they are tweeting about content that is relevant to your audience/brand (you only want to target influencers that are relevant to your niche). Then, when you find one you want to pursue see if you can find him or her on Google+. Find them in G+ either by searching their real name or their business name in G+, or by searching them in Google, or you can even Tweet them and ask if they’re on Google+. Finding your Google+ thought leaders is simply a matter of identifying your niche thought leaders and then searching for those people on Google+. Sometimes you will use Google+ and Google+ tools like Ripples to find them, but other times — especially if you’re searching completely in the dark — it can be strategic to tap resources outside of G+ and then work backwards. The big takeaway here is to remember that influencers are influencers because they reach a lot of people, and because those people listen to what the influencer has to say. So, when you’re searching for potential influencers keep an eye out for signs that people are listening when your potential talks. Twitter followers, re-shares, speaking spots at conferences, glowing Amazon.com book reviews; these are all signs that indicate mass following, mass listening, and mass influencer potential. How do you identify influencers within your niche market? Share with us in the comments. Does Every Niche Need An Engine? In Twitter, these are the people whose tweets get favorited, retweeted, embedded, and replied to by tens or hundreds of people the moment they appear in tweet feeds. These are the people for whom others would immediately halt scrolling down and spare precious few seconds to find out what it is they want the world to know. In short, influencers are the people whom other people listen to. Most importantly, they spur others into some sort of action just by saying something in 140 characters or less. Some newbies might think why following influencers is important. For them to understand, these influencers in different social media platforms can provide you with great resources to increase your knowledge exponentially. The six ways on how to find them are easy to follow, you gave us a brief review and idea how. Thanks for this!